It is with joy that I meet all of you who are taking part in the national convention of associations and groups dedicated to the Venerable Giorgio La Pira. I address my greetings to each and I thank the President of the Giorgio La Pira Foundation for his words. I hope that your study and reflection meeting can contribute to making the commitment to the integral development of people grow in the Italian communities and regions in which you are part. At a time when the complexity of Italian and international political life requires lay faithful and statesmen of great human and Christian importance for the service of the common good, it is important to rediscover Giorgio La Pira, an exemplary figure for the Church and for the contemporary world . He was an enthusiastic witness of the Gospel and a prophet of modern times; his attitudes were always inspired by a Christian perspective, while his action was often ahead of its time. His activity as a university professor was varied and multiform, especially in Florence, but also in Siena and Pisa. Next to it, he gave life to various charitable works, such as the "Messa del Povero" at San Procolo and the Saint Vincenzo "Beato Angelico" Conference. From 1936 he lived in the convent of San Marco, where he studied the patristics, also taking care of the publication of the magazine Principi, in which there was no lack of criticism of fascism. He was sought after by the police of that regime and took refuge in the Vatican, where for a period he stayed in the house of the Substitute Mons. Montini, who had great esteem for him. In 1946 he was elected to the Constituent Assembly, where he contributed to the drafting of the Constitution of the Italian Republic. But his mission at the service of the common good found its summit in the period when he was mayor of Florence in the fifties. La Pira assumed a political line open to the needs of social Catholicism and always sided with the last and most fragile sections of the population. He also undertook a major program to promote social and international peace, with the organization of international conferences "for peace and Christian civilization" and with vibrant calls for nuclear war. For the same reason he made a historic trip to Moscow in August 1959. His political-diplomatic commitment became more and more incisive: in 1965 he convoked a symposium for peace in Vietnam in Florence, then went personally to Hanoi, where he was able to meet Ho Chi Min and Phan Van Dong. Dear friends, I encourage you to keep alive and to spread the patrimony of ecclesial and social action of the Venerable Giorgio La Pira; in particular his integral witness of faith, love for the poor and the marginalized, work for peace, implementation of the Church's social message and great fidelity to Catholic teachings. These are all elements that constitute a valid message for the Church and society today, supported by the exemplariness of her gestures and words. 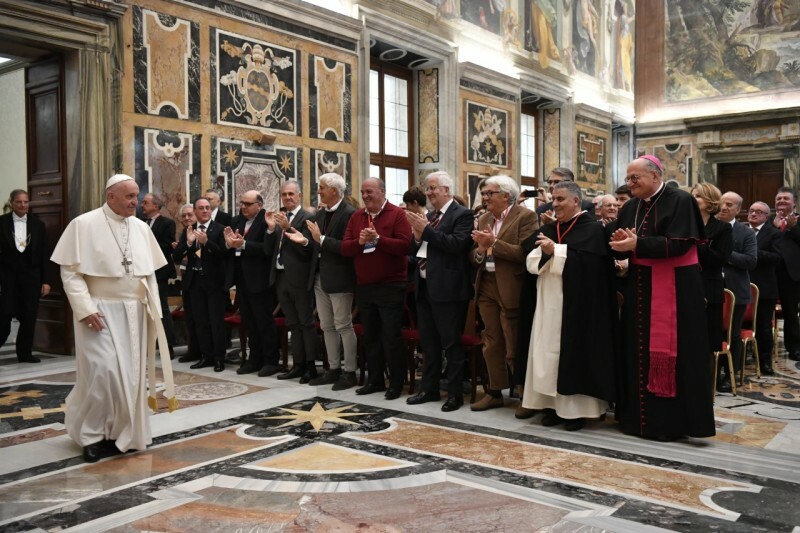 His example is precious especially for those who work in the public sector, who are called to be vigilant towards those negative situations that St. John Paul II defined as "structures of sin" (see Encyclical Letter Sollicitudo rei socialis, 36). They are the sum of factors that act in the opposite direction to the realization of the common good and respect for the dignity of the person. One yields to such temptations when, for example, one seeks exclusive personal or group profit rather than everyone's interest; when clientelism prevails over justice; when the excessive attachment to power effectively blocks generational change and access to new recruits. As Giorgio La Pira said: "politics is a commitment of humanity and holiness". It is therefore a demanding path of service and responsibility for the lay faithful, called to animate temporal realities in a Christian way, as the Second Vatican Council teaches (cf. Decree on the apostolate of the laity Apostolicam actuositatem, 4). today it takes a "spring". Today we need prophets of hope, prophets of holiness, who are not afraid to get their hands dirty, to work and move on. Today it takes "swallows": be you. With these wishes, which I entrust to the intercession of the Virgin Mary, I warmly bless all of you, your loved ones and your initiatives. And I ask you to please remember to pray for me. Thank you!